In the lead-up to Prince William's 21st birthday Britain's Royal Mail has released a set of stamps to celebrate the future king's coming of age. 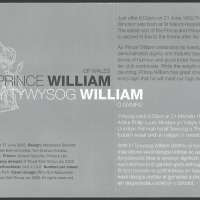 The stamps, which went on sale Tuesday (17 June 2003), four days before William's birthday feature photographs of the prince taken when he was 18 and 19 and his early days at the university. Prince William made his British stamp debut in 2000 when four generations of the Royal Family appeared on a miniature stamp to commemorate the Queen Mother's 100th birthday. 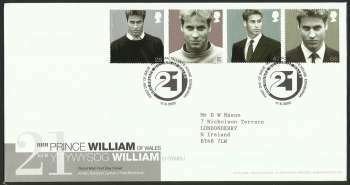 Prince William will become the first member of the Royal Family in history to have a set of stamps issued to mark his 21st birthday. It is also the first time the Royal Mail has issued a stamp solely of Prince William, who is second in line to the throne. 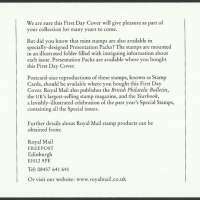 The Royal Mail printed more than 20 million stamps bearing his image. The first-class stamp, which shows William arriving at St. Andrew's University is also the first stamp to show the new postage price of 28 pence. Two show Prince William in casual clothes, two are of him dressed smartly in a suit and tie. 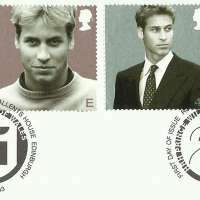 Other stamps show William at his father Prince Charles's Highgrove home in Gloucestershire, western England. E is a letter rate for airmail within Europe. It was sold for 38p on the day of issue. Background colors are printed with Iriodin ink, giving stamp a three dimensional appearance. Stamp size: 35 x 35 mm. The stamps were printed by Walsall Security Print in gravure. Design is by Madeleine Bennett. Dimension: 218 x 115 mm. Just after 9.00 pm on 21 June 1982 Prince William Arthur Philip Louis Windsor was born at St Mary’s Hospital, Paddington, in London. The eldest son of the Prince and Princess of Wales, Prince William is second in line to the throne after his father. As Prince William celebrates his twenty-first birthday, he has already demonstrated dignity and maturity beyond his years. His engaging sense of humour and good looks have guaranteed him a growing fan club worldwide. While the weight of his responsibilities must be daunting, Prince William has great strength of character and shows every sign that he will meet our high expectations for the future. Ychydig wedi 9.00 pm ar 21 Mehefin 1982 ganed y Tywysog William Arthur Philip Louis Windsor yn Ysbyty St Mary’s, Paddington, yn Llundain. Fel mab hynaf Tywysog a Thywysoges Cymru, y Tywysog fyddai’r nesaf ond un i esgyn i’r orsedd ar ôl ei dad. Wrth i’r Tywysog William ddathlu ei ben-blwydd yn un ar hugain oed, mae eisoes wedi dangos urddas ac aeddfedrvvydd y tu hwnt i’w flynyddoedd. 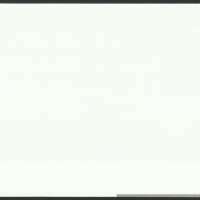 Mae ei synnwyr digrifvvch hoffus a’r ffaith ei fod yn olygus wedi sicrhau bod ganddo glwb edmygwyr byd-eang sy’n tyfu o hyd. Er bod pwysau ei gyfrifoldebau yn frawychus, mae’r Tywysog William wedi dangos cryfder ei gymeriad a phob arvvydd y bydd yn cyflawni ein disgwyliadau uchel yn y dyfodol.